Cannabis jobs are way more diverse than most people realize. When most people think about cannabis jobs, positions like budtender or grower come to mind. In actuality, opportunities throughout this industry are much more diverse, ranging from software developer to chemist to sales professional. Take your pick from any of these 500 cannabis jobs! If working in cannabis sounds like a dream come true, you're in the right place. Here are 11 essential tips to get you started. What kind of environments do you thrive in? Unleash your brain’s creativity and explore your deepest thoughts with activities like journaling or mind mapping. Dig deep and consider where your talents may be best used. What unique perspective or contribution can you bring to this industry? Time to get curious and think outside of the box. Is there a cannabis business you would love to work for? Visit their website, see what you can find on Google – explore as much as you can. Learn more about the company’s team, mission, and values. No two businesses are exactly alike. The more you know about a company’s current needs and challenges, the more you can understand how you might come in and add value instead of simply asking for a job. The current legal situation in cannabis is complicated, to say the least. However, depending on your profession in this industry, fewer restrictions may apply. When you're not directly "touching" the plant, the legal situation isn't quite so dubious. But be cautious. There is no one size fits all when it comes to regulations. What may apply to one person or business may not apply to you. Take personal responsibility and assess your situation. 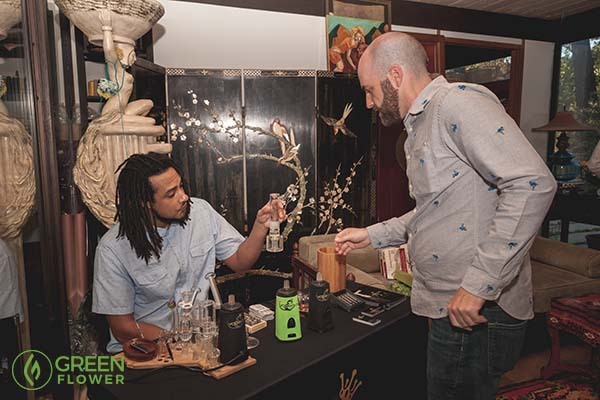 Cannabis events are a great way to connect and find opportunities to get involved. Cannabis is a relatively tight-knit community, an industry born out of activism. People in this space have banded together to combat local, state, federal, and international restrictions. Their hard work has laid the foundation of this industry. However, that doesn’t mean there isn’t room for newcomers! There are numerous cannabis-based operations seeking outside talent. A genuine sense of curiosity and a passion for this plant can take you far. Meet the faces behind the companies. Get to know them and hear their stories. Above all, be present and get active in the cannabis community. Show that you actually want to make a positive contribution in this space. Joining this industry isn't just about finding a job; it's about making a difference. Volunteering is a great way to put your talents to work. It also demonstrates to potential employers or colleagues your passion and commitment to this plant. Remember it’s not about getting a new job but coming in and adding value! Investing your time as a volunteer can establish trust. After all, even if you don’t have experience working in a cannabis company, volunteering for an advocacy group can help you get your foot in the door. A few hours of your time can have a huge impact. Find out who is working toward cannabis reform in your area and don't be shy about reaching out. Did you know you can find employment opportunities in the cannabis industry using online job boards like Monster and Indeed? LinkedIn is another big resource. These are only a fraction of the jobs available. When searching, leave the location blank in your search to find opportunities nationwide. And while many positions will be listed in multiple locations, it's wise to explore more than one outlet. In addition, don't forget to do some homework on your potential employer. If it seems too good to be true, it might be. Look for any red flags and trust your instincts. Using an online job board is a great starting point if you’re considering entering the cannabis industry. But it’s also worth mentioning cannabis staffing agencies. These agencies specialize in matching the right candidates with the right employers, which can save you time in your job search. So, is it the right move for you? Ultimately that is your call to make. If you're someone who would like some assistance, a staffing agency may be perfect. But if you're someone who tends to be a self-starter, it may not be worth your while. It's all about finding what works for you. There is no single "perfect" way to enter this industry. Worried that your location will limit your job search? Although living in a place where cannabis is legal will obviously allow you to pursue more employment opportunities – cannabis is global. Regardless of your current zip code, you can begin interacting with this community. Virtual networks like Facebook, LinkedIn, or Instagram are a fantastic way to begin making connections. A simple hello or thoughtful message can lead to a long-term relationship over time. The more you immerse yourself in the cannabis world, the more you'll understand how you can find your niche. The future of cannabis relies on many different skill sets. We each have something unique to bring to the table. Instead of worrying about what you don't have, focus on what you do. For example, have you worked in accounting for the last 20 years? Great! Maybe you can help a cannabis company with their taxes or bookkeeping. Experienced in graphic design? Perfect, you could specialize in designing logos or websites for cannabis businesses. Whatever your passions are, find a way to apply them to cannabis. If you want to be successful, let go of your fear of failure and start taking action. No one is perfect. All of us are going to make mistakes. So take risks, be vulnerable, and ask questions. Figure out how you can use the tools and resources available to engage in meaningful action. Keep a daily to-do list and follow through. We all are learning and growing with this plant. Amazing opportunities in the cannabis world are here for the taking. It is up to you to act on them. Why do you really want to enter the cannabis industry? Are you looking to get rich quick or provide real value in this space? Cannabis is a rocky yet exciting industry. There are major challenges and incredible rewards. What we do today has the potential to drastically change our future. Building this industry isn't about getting "in" on the next big thing; it's about shifting paradigms, sharing truths, and opening hearts and minds toward this amazing plant. Do want to learn more about finding work in the cannabis industry?